Napanee's Curtis Marrison skates around his own net while a Port Perry Mojack player pressures during Sunday's game in Port Perry. Photo by Adam Bramburger. Offense was provided from a variety of sources for the Napanee Raiders this weekend, as eight different players accounted for 10 total goals in 5-2 and 5-0 wins over Gananoque and Port Perry. At home on Friday the Raiders got off to a bit of a slow start, falling behind 1-0 late in the first period when Ben Tigert scored unassisted for the visitors at 17:21. Cullen Hinds prevented the Raiders from heading into the dressing room down a goal, scoring in the final seconds of the period with help from Curtis Marrison and Keegan Wayte. Napanee carried that momentum out of the first intermission right into the second, scoring three times within the opening five minutes. Hinds had his second of the game at 2:40 followed by Devon King at 3:01 and Evan Foley at 4:48. Austin Labelle tacked one on at 15:50 for a comfortable 5-1 lead. Luke Joseph, Brodie Maracle, Cameron Sheehy, Dayton Kent, Cam Harris and Justynn Steven were all credited with assists. Gananoque’s Drew Marquette broke the string of five unanswered with a goal midway through the third, but it wasn’t nearly enough. Napanee’s Bailey Maracle earned the win in net, stopping 18 of 20 while former Raider Jeremy Piazzi took the loss, allowing all five goals on 43 shots. Napanee was 0-7 on the power-play while Gananoque was 0-2. 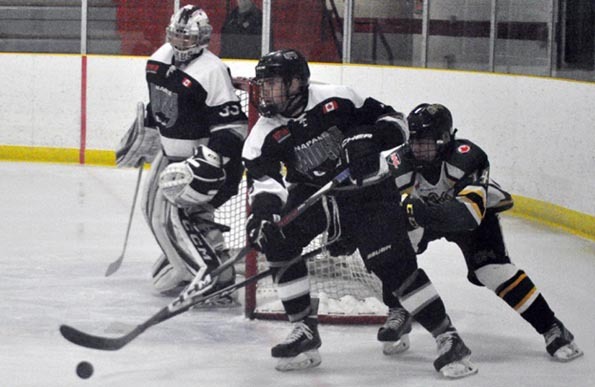 On Sunday evening the Raiders made themselves right at home in their only scheduled visit to the Scugog Memorial Arena, dominating the Port Perry Mojacks in a 5-0 win. Nicholas Nabuurs earned the shutout with 19 shots while the Raiders peppered his counterpart Corey Kuypers with 53 shots. Harris opened the scoring with a power-play goal 5:31 into the game. Just over 10 minutes later Nelson Powers doubled the lead with a power-play strike of his own. Foley had the lone goal of the second period, scoring just 24 seconds into the middle frame. Ryan Casselman and Steven added insurance in the third with one goal each. Kent, Powers, Casselman, Foley, Labelle, Steven, Jacob Gilbert and Wayte all earned assists. The Raiders were 2-5 on the power-play while killing all six Mojack man-advantages. With their two wins the Raiders improve to 13-1-1 on the year, running their unbeaten streak to 12 straight in the process. They’ll look to continue their winning ways with two two home games this weekend, starting with a Friday showdown against the 1-11-2-1 Little Britain Merchants of the Orr Division. These two clubs do have a bit of history, as the Raiders topped the Merchants in Game 7 of the 2010 Schmalz Cup quarter-finals. Prior to Friday’s game, members of Napanee Legion Branch 137 will perform their annual colour parade at centre ice to commemorate upcoming Remembrance Day ceremonies. Puck drop is 7:30 p.m.
On Sunday the Raiders will welcome the Georgina Ice to the SPC for a 7 p.m. puck drop. The Ice are 5-7-1 on the year.